Termites can be a big problem for Temecula homeowners, and Knockout Pest Control is here to help if termites have made their way into your home. But there are also things you can do—certain preventative measures you can take—to help keep termites from taking up residence in your home. Subterranean termites are the most common type of termite found in Temecula. As their name implies, they reside largely underground. Because of this, the most common way for termites to get inside your home is through wood-to-ground contact. Decks, wood support posts holding up a patio cover, and doorframes are all areas you should keep an eye on. Subterranean termites can also find their way inside and do their damage through cracks in your foundation. They only need a crack as small as 1/32 inch (roughly the width of a paperback book cover) to get in. And once they’re in, they begin feasting on your home’s studs and wood bracing. They can gain access to your house above the ground as well. By using mud tubes for protection, they can travel up the side of your house until they find a point of entry. Keep an eye out for mud tubes, and contact a Temecula termite control company as soon as you spot one. Drywood termites, on the other hand, can get in almost anywhere there is a crack or opening in your home. The most common place for drywood termites to start their damage is in the eaves of your home. They can also get in through an open window or door. One way to help keep your home free of termites is to keep wood away from your home as much as possible. Woodpiles and wood structures (like doghouses) should be located away from the home. Wood mulch should also not be used right next to your house. Opt for gravel or rubber mulch instead. Building patio covers and decks out of composite wood materials is another way to prevent termites. 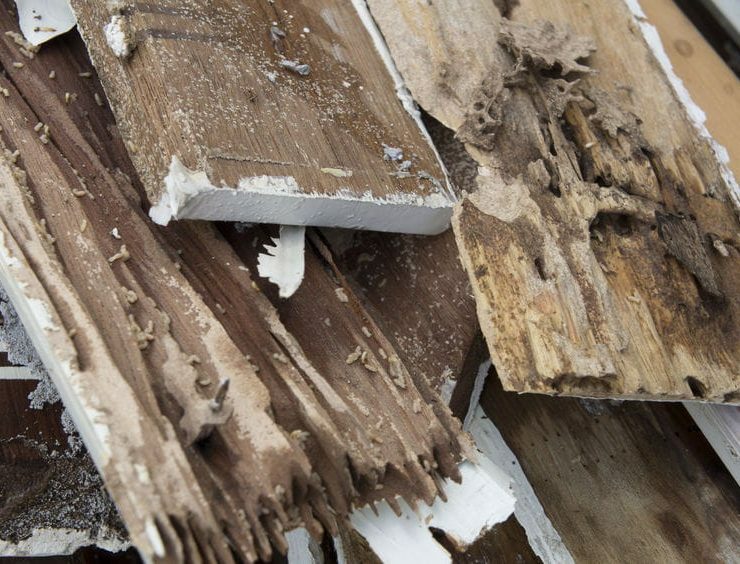 Yes, the materials are usually more expensive up front, but it can be well worth the cost if it keeps termites from doing expensive damage to your home. Seal any cracks in your home’s foundation and store infrequently-used items in plastic (rather than cardboard) boxes—especially in your attic and garage, where there is usually exposed wood. Fix any leaky pipes right away, as termites are attracted to water. If you have any wood on the outside of your home (like door or window frames, a wood deck, or wood patio cover), make sure it is either painted or sealed with quality wood sealant. If you suspect you already have termites or want to know more about how to keep termites from getting in your home, contact Knockout for a termite inspection. We can come to your Temecula, Murrieta, or Fallbrook home and give you our recommendations for termite control and termite treatment.